Do you feel your body shake and tense up with fear at the thought of going to the dentist and having your teeth drilled and cleaned? Would you rather tolerate the pain and anguish of a toothache or be brave enough to step into your dentist’s clinic? Don’t be hard on yourself, you’re not alone. 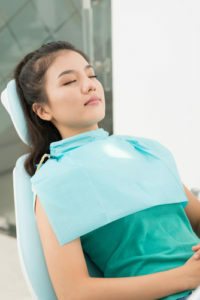 Many people fear and have reservations about going to a dentist..
Sedation dentistry has played a big part in taking away the anxiety of those people who avoid going to their dentists. Be it tooth cleaning or an invasive procedure, sedation can an excellent option for different dental procedures..
To help the patients relax and ease during their dental procedures, sedation medications are used. It is also called “sleep dentistry,” even though patients are generally awake. The medication is offered in many different forms and levels of sedation. The medication can be inhaled, taken as a pill, through IV, or via general anesthesia. The form of sedation is determined based on the patient’s level of anxiety and the procedure being done. Minimal sedation: You are awake and well-aware but are relaxed. Moderate sedation: your speech may slur and you may not remember your procedure. General anesthesia: you are not aware of the procedure as you remain unconscious. For some people, sensitive teeth or gums can be a cringing and shuddering dental experience. However, with the help of sedation dentistry, they are able to experience the most relaxed trip to their dentist. Your dentist will sedate you just well enough to be oblivious of your treatment. When your treatment is over, you will wake up feeling fresh and well rested with little or no memory whatsoever of your treatment. Sedation dentistry is not just for the nervous ones. Dental procedures such as tooth extraction that require the dentist to numb your gums is also a part of sedation dentistry. There were those days when you needed to schedule several appointments for just one single procedure. Thanks to sedation dentistry, your dentist is able to cover a lot of ground in lesser amount of time. Now that patients are relaxed and comfortable, dentists are able to complete the procedure without having to schedule multilple appointments. It can be a challenge for patients who have disorders such as Autism Spectrum Disorder or Sensory Processing Disorder to visit their dentist and stay comfortable during the treatment process. With sedation dentistry, they can now get the treatment they need and have a relaxed visit. Before, it was tough to convince these patients to visit their dentists and get their necessary treatment. Sedation dentistry helps both, the patient and the dentist in getting the treatment done easily and comfortably.